NASA's industrious Curiosity Rover has identified another drilling target, called Bonanza King, which rests at the northeastern end of what the agency refers to as the "Hidden Valley." If the rock, which NASA says looks like a "pale paving stone," passes engineers' evaluation, Curiosity will proceed to drill into stone in an effort to further uncover the mysteries below. The original goal was to find a site at "Pahrump Hills," but Curiosity was unable to reach its intended destination because of difficult driving conditions. However, NASA says the newest area and geological layers resemble the Pahrump Hills outcrop, which the agency says will give researchers more information for its overall mission, which is to understand what researchers believe was once a planet that supported life. Arriving at Mount Sharp is NASA's ultimate goal, a site believed to contain plenty of evidence about the Red Planet's past. Curiosity has drilled into three different rocks since landing on Mars back in 2012, but there's still much to learn. If the rock is deemed fit for drilling, the plan will be to drill down and then deliver the sample for onboard analysis. "One step is assessing whether Bonanza King can be drilled will be to check whether the individual plates of the outcrop are loose," NASA said. "During the drilling campaign, the team will also be analyzing possible routes to Mount Sharp and planning how to better understand how the rover's wheels interact with Martian sand ripples." It was the sand ripples that that restricted Curiosity from reaching Pahrump Hills. Bonanza King, however, appears to be a worthy alternative. "This outcrop on the ramp is too appealing to pass up," said Curiosity Deputy Project Scientist Ashwin Vasavada. 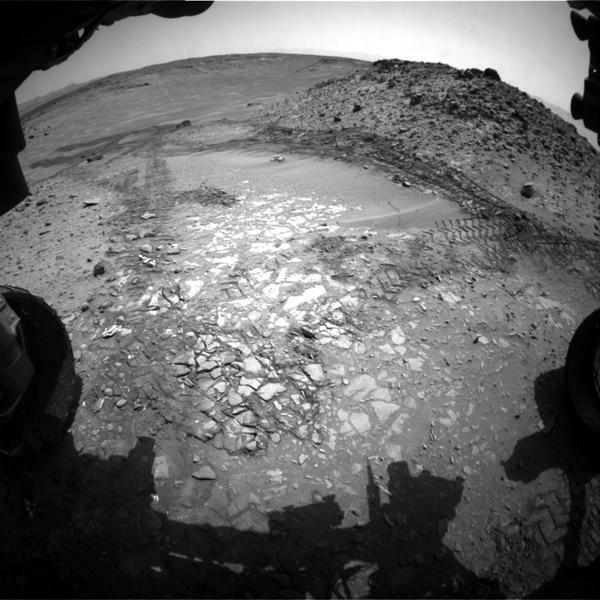 The above image is a view down "Hidden Valley" ramp at "Bonanza King" on Mars.